Above: Extracting a needle--very carefully--from the Bonnet Carré Spillway during its opening on January 10, 2016. Each of the 350 concrete bays holds 20 needles. Image credit: Bob Henson. 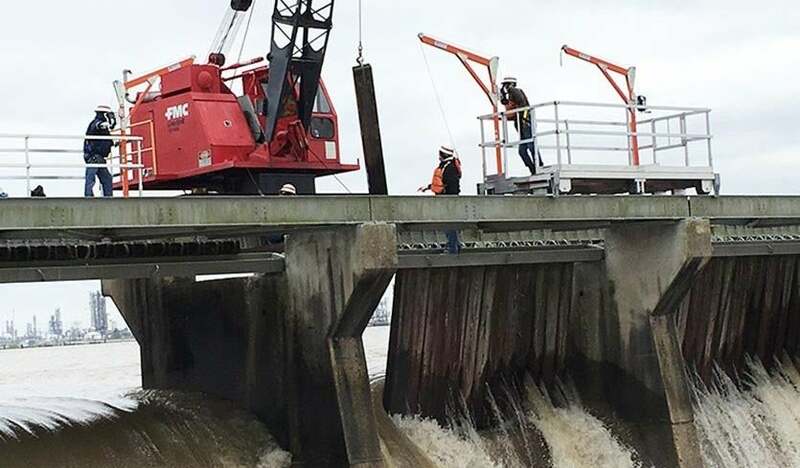 At 10 am CST February 27, 2019, the U.S. Army Corps of Engineers opened the gates on the Bonnet Carré Spillway in St. Charles Parish, Louisiana to allow flood waters from the swollen Mississippi River to flow into Lake Pontchartrain. This marks the first time in the 88 years of the spillway's existence that it needed to be opened in consecutive years. Opening of the spillway is expected to keep the Mississippi River below its 17-foot flood stage in New Orleans; levees there protect the city against floods three feet higher than that. The latest National Weather Service forecast predicts that the river will rise to minor flood stage in New Orleans on March 19, but opening of the Bonnet Carré Spillway should prevent that from occurring. Figure 1. 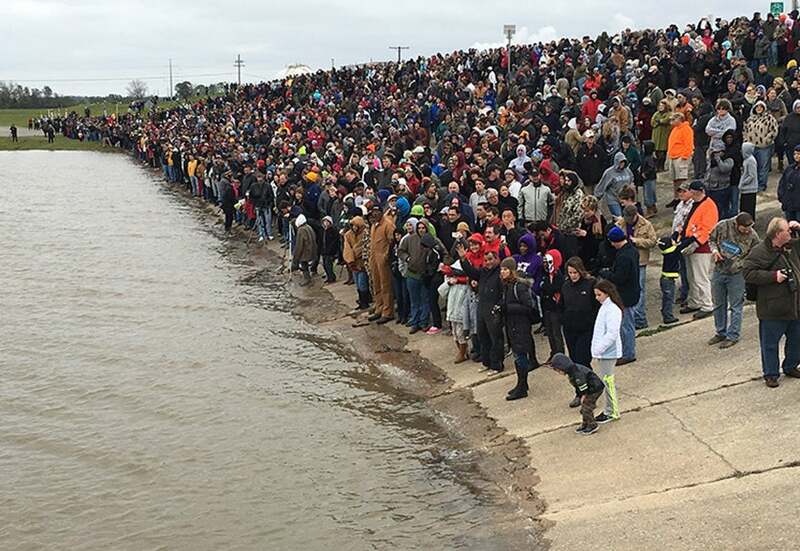 Crowds line the slopes of the outlet between the Mississippi and Lake Ponchartrain downstream from the Bonnet Carré Spillway during its opening in January 2016. 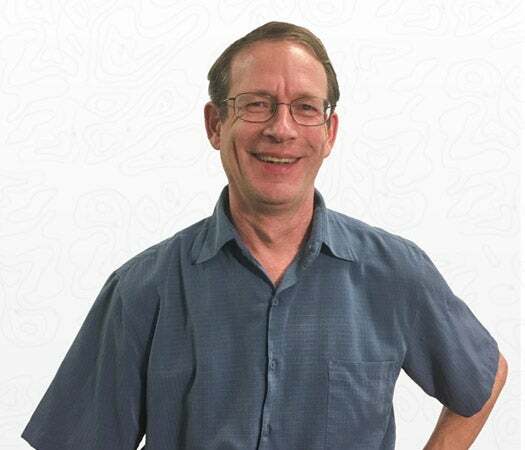 Image credit: Bob Henson. When all 350 bays are opened, the spillway can divert one-fifth of the river’s water into Lake Pontchartrain. The last time all 350 bays were opened was in 1983. This year, the Army Corps plans to open 38 of the 350 bays to start, then increase this number to as many as 200 bays when the flood crest arrives later in March. The spillway is scheduled to operate for about a month. The spillway has been opened just thirteen times since 1937, but with increasing frequency in recent years—five of the thirteen openings have occurred since 2008, including three of the past four years. The spillway was last opened in March 2018, when it was operated at approximately half of its capacity. Although the spillway drains water into Lake Pontchartrain through uninhabited land that is primarily used for recreation, operation of the spillway does come with a cost: the excess fresh water that drains into the Gulf of Mexico is harmful to the oyster industry. The prolonged opening of the spillway in 2011 likely cost the Mississippi oyster industry $22 - $46 million and the loss of several hundred jobs during the period 2011 – 2013, according to an analysis by Mississippi State University. Water levels on the Mississippi RIver are not high enough to force the Corps to open the Morganza Floodway in Pointe Coupee Parish northwest of Baton Rouge, which would divert water from the Mississippi River down the Atchafalaya River. That floodway has been opened only twice--in 1973 and 2011--and has a much higher cost to open compared to the Bonnet Carré Spillway. The value of property at risk of flooding in the Morganza Floodway is up to $2.2 billion, including over 21,000 homes. Figure 2. 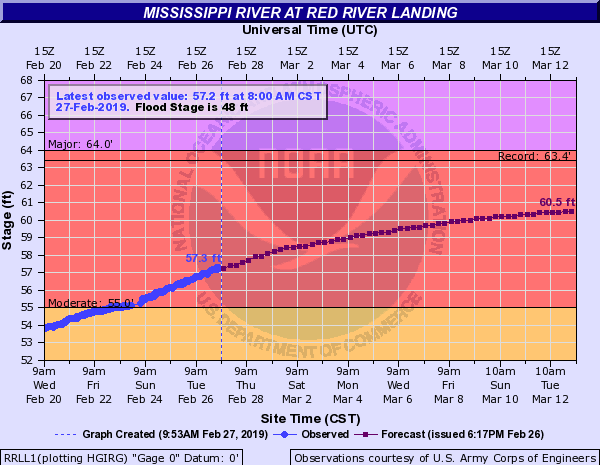 Wednesday’s forecast from the NWS River Forecast Center predicted that the Mississippi River would crest at Red River Landing, just above the Morganza Floodway, on March 16, at 61'. This would be the river’s fourth highest flood on record, and similar in height to the ones in 2018 and 2016. Including 2019, five of the top seven floods on record at Red River Landing--where records extend back to 1851--will have occurred since 2008. The all-time record crest there was 63.39' on May 18, 2011, when the Corps was forced to open the Morganza Floodway in order to relieve pressure on the Old River Control Structure. Record flooding along the Lower Mississippi caused $3.3 billion in damage that year. See our 2011 post, America’s Achilles Heel: the Mississippi River’s Old River Control Structure, for more information on why it is necessary to protect the Old River Control Structure. Image credit: USGS. Weather.com published an excellent long-form piece on the Bonnet Carré Spillway back in 2016, which has a very detailed look at its history, function and ecological impacts. The heavy rain this month in the mid-South and Ohio Valley has propelled several cities to their wettest Februaries on record, causing significant river flooding. 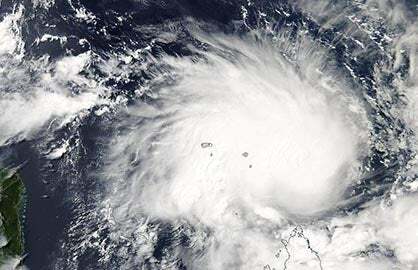 Nashville, Tennessee (13.47 inches), Tupelo, Mississippi (15.48 inches), Knoxville, Tennessee (12.83 inches), and Huntsville, Alabama (12.60 inches) have all had a record-wet February. The heavy rains have brought major flooding to the Mississippi, Ohio, and Tennessee rivers, with days or weeks of major flooding expected along portions of all three rivers. Major flooding was occurring on Wednesday at three gauges on the Tennessee River in western Tennessee, but the river has crested and was beginning to fall. The river crested on Wednesday in Perryville, Tennessee, at its second-highest level in records dating to at least 1897. Farther upstream, at Savannah, Tennessee, the river crested on Tuesday at its third-highest level on record, dating to 1897. The first three gauges on the Ohio River upstream from the Ohio River’s confluence with the Mississippi River are all at major flood stage. The Ohio River at Smithland Lock and Dam was 12 feet above flood stage on Wednesday afternoon, its second highest level there since record keeping began in the early 1980s. 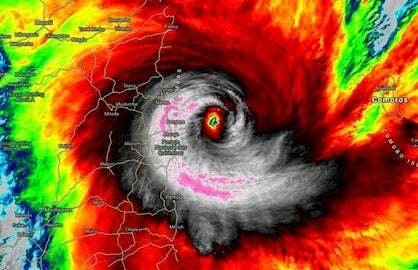 The NWS states that at this level, “Large amounts of property damage can be expected. 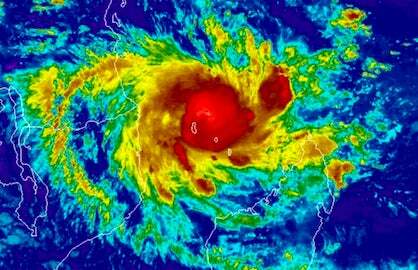 Evacuation of many homes and businesses becomes necessary. Highway 60 in Smithland closes.” At its confluence with the Mississippi River at Cairo, Illinois, the Ohio River is forecast to crest this weekend at its third highest level on record. As these crests work their way into the Mississippi River, they are expected to cause major flooding from Tennessee to Louisiana, with the predicted flood crests expected to be among the ten highest recorded since the modern levee system was built in 1928. With the spring snow melt season yet to come, a second round of major flooding may occur in April, subjecting the Mississippi River levee system to an extended period of stress.